Cloud-based videoconferencing adoption has benefitted businesses in myriad ways. Here are four ways videoconferencing can help your organization. Due to the dynamic nature of the business landscape and the changing needs of organizations, videoconferencing has emerged as the most popular form of communication in the business world. While video conferencing has existed for more than a decade now, we are now feeling its true business benefits. We’re moving from hardware-based videoconferencing to software and service based solutions. Cloud-based videoconferencing has allowed businesses to experience seamless collaboration without having to worry about hardware and infrastructure costs. With an increasing number of businesses opting for cost-effective services managed outside their premises, cloud-based videoconferencing is fast becoming the norm. Several recent studies show that the cloud is where videoconferencing is headed. A new Global Industry Analysts (GIA) report predicts the cloud videoconferencing market could reach over $2 billion by 2020. According to another report, the cloud-based videoconferencing market is going to grow at a CAGR of 39.6 percent by 2019. What are the factors driving this growth? A recent IDG Connect survey estimates that by the end of this year, the mobile workforce will number 1.3 billion globally – that’s nearly a third of the total global workforce. As mobile penetrates deeper into the business space, it will cause more businesses to adopt cloud-based videoconferencing as a means to collaborate from anywhere, at any time. 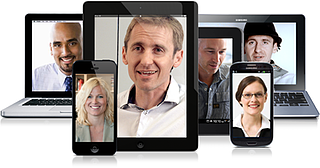 Moreover, cloud videoconferencing supports BYOD practices, one of the biggest reasons for its popularity. The dispersed nature of business requires a communication solution that allows teams from diverse locations to meet, collaborate, exchange files and documents, and solve problems together. The idea is to collaborate as if you’re in the same room. This helps remote workers feel they are truly part of the conversation. Cloud videoconferencing replicates the benefits of face-to-face communication at a fraction of the cost of in-person meetings. Videoconferencing also eliminates the need to dive into heaps of emails or texts every time you need to refer to something discussed in the past. It also helps prevents miscommunication, saving time and improving productivity for day-to-day business dealings. According to a recent HP survey, video communication is eight times more effective that e-mail communication. Cloud-based services bring down the cost of operations and videoconferencing is no exception. With no infrastructure and/or hardware to maintain, cloud-based videoconferencing makes effective collaboration affordable to everyone. There is no doubt that the landscape of the mobile workforce and global collaboration is rapidly changing. The question is, what technology and tools is your organization embracing to maximize the potential of this exciting trend?